A strong trough moving across central Europe towards northern Mediterranean while transforming into an upper low. A MDT risk has been issued for southern Albania and western Greece with threat for heavy convective rain with flash floods as well as a tornado potential. A SLGT risk has been issued for southern Italy and Mediterranean sea with threat for heavy rain, strong to severe winds and tornadoes. 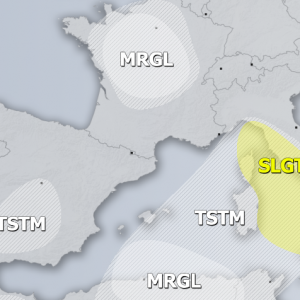 A SLGT risk has been issued for nothern Mediterranean with threat for heavy rain and strong winds. A SLGT risk has been issued for parts of North sea and coastal areas of Belgium and Netherlands with threat for waterspouts under very cold mid levels.